Posted on 19.2.2009 at 23.52. As some of you might have noticed, it’s all about red cinnabar nowadays. I’ve often used little synthetic (some kind of plastic) cinnabar hearts and butterflies over the years but when I was in Barcelona almost two years ago I made a discovery. There was this tiny little shop in Barri Gòtic called Antoní Jover where an adorable old man sold mainly laces and ribbons (yes, it was the sweetest shop ever!) 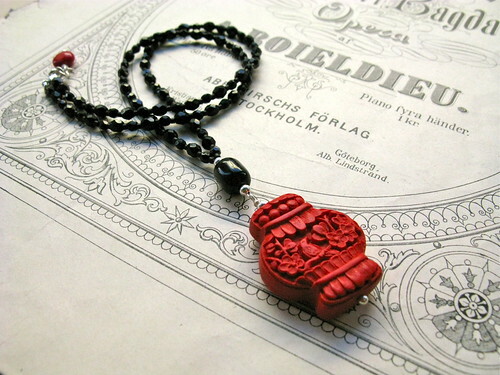 but he also had a selection of Chinese, beautifully hand-carved red cinnabar (lacquer) beads. Although they were quite expensive I bought a small handful of them and last year a dear friend of mine brought me some more. It breaks my heart to use them so I still have quite a few left. Now I think I’ve been stashing them away for far too long and have decided to at least continue the Garden Song series. These gorgeous beads belong in jewellery!